The Co-Operative Movement: An Alternate Way of Organizing How We Live? A discussion led by Gaia Kile, Vice president, Board of Directors, People’s Food Co-op, Ann Arbor. 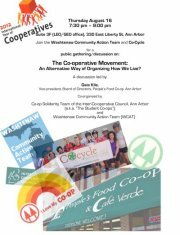 Washtenaw Community Action Team (WCAT) and the Co-op Solidarity Team of the Inter-Co-operative Council, Ann Arbor (a.k.a. The Student Co-ops).